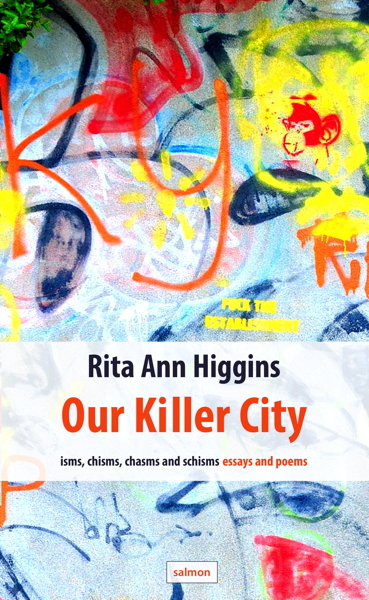 Our Killer City: isms, chisms, chasms and schisms gathers together articles from Rita Ann Higgins’ Sunday Independent ‘This Woman’s Life’ column, as well as other select essays and poems, many of which are previously unpublished. RITA ANN HIGGINS was born in 1955 in Galway, Ireland, where she still resides. Her first five poetry collections were published by Salmon: Goddess on the Mervue Bus (1986); Witch in the Bushes (1988); Goddess and Witch (1990); Philomena’s Revenge (1992); and, Higher Purchase (1996), as well as a memoir Hurting God (2010). Bloodaxe Books published her next five collections: Sunny Side Plucked (1996); An Awful Racket (2001); Throw in the Vowels: New & Selected Poems in May 2005 to mark her 50th birthday; Ireland is Changing Mother (2011), and Tongulish (2016). Her plays include: Face Licker Come Home (Salmon 1991); God of the Hatch Man (1992), Colie Lally Doesn’t Live in a Bucket (1993); and Down All the Roundabouts (1999). In 2004, she wrote a screenplay entitled The Big Break. In 2008 she wrote a play, The Empty Frame, inspired by Hanna Greally, and in 2008 a play for radio, The Plastic Bag. She has edited: Out the Clara Road: The Offaly Anthology in 1999; and Word and Image: a collection of poems from Sunderland Women’s Centre and Washington Bridge Centre (2000). She co-edited FIZZ: Poetry of resistance and challenge, an anthology written by young people, in 2004. 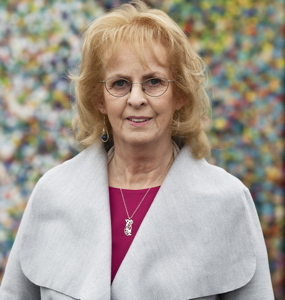 She was Galway County’s Writer-in-Residence in 1987, Writer-in-Residence at the National University of Ireland, Galway, in 1994-95, and Writer-in-Residence for Offaly County Council in 1998-99. She was Green Honors Professor at Texas Christian University in October 2000. She won the Peadar O'Donnell Award in 1989 and has received several Arts Council of Ireland bursaries. Her collection Sunny Side Plucked was a Poetry Book Society Recommendation. She was made an honorary fellow at Hong Kong Baptist University in November 2006. She is a member of Aosdána.